Identification: Highly flattened body. Long pointed snout. Leading edges of pectoral fins are concave near tip of snout, convex around head and have a second more defined concavity behind head before extending outward to free tips. Trailing edge of pectorals broadly rounded. Pelvic fins distinct. Row of spines above each eye and from lower back along tail. Dorsum shades of brown with subtle dark and/or pale spots. Dark patch on snout is not always obvious. Prominent dark circle (ocelli) on each pectoral fin with light centers. Ventrum pale. Eyes proportionately larger than big skate. Size: Maximum length 120cm but usually from 60 to 90cm. Habitat: Sometimes seen on low lying kelp (broadleaf kelp) but generally found on gently sloping sand and mud bottoms usually below 20 meters to 600 meters. Inhabits coastal areas, estuaries, bays and continental shelves. 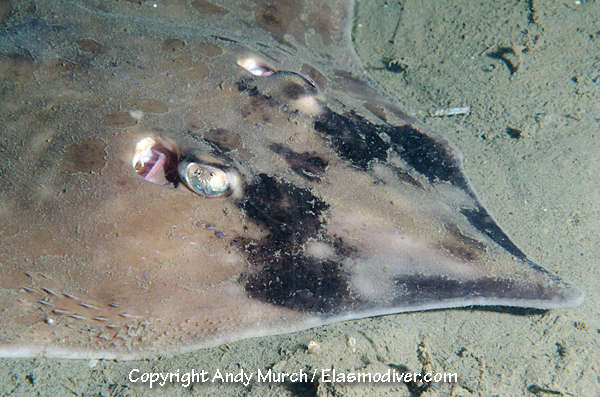 Abundance and distribution: Once frequently encountered in British Columbia and Washington, Longnose skates are now uncommon from Alaska to Southern California. Behavior: Usually seen lying motionless on substrate or under sand with eyes protruding but occasionally seen actively foraging over soft bottoms. May occasionally enter shallows in search of food. Reproduction: Oviparous. Lays flattened egg capsule with hooked extensions on corners. Photographs: Deep Cove, Vancouver Island. 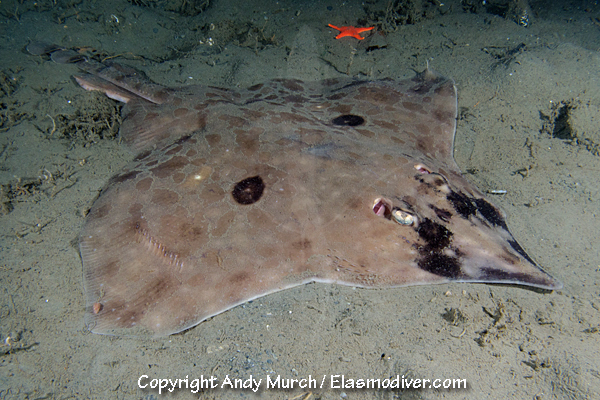 Similar species: Big skate - Raja binoculata distinguished by more kite shaped body and dark centers of occeli, California skate - Raja inornata, and Starry skate - Raja stellulata which has a blunter snout and more intricate markings. Reaction to divers: Very docile. Remains motionless unless molested. Try not to hover directly above the body as this may cause it to bolt. Diving logistics: Rarely seen at a few locations along the North Pacific coastline. The photograph above was taken in November at Deep Cove, Vancouver Island in110ft of water on gently sloping silt far from any walls or reef structure. 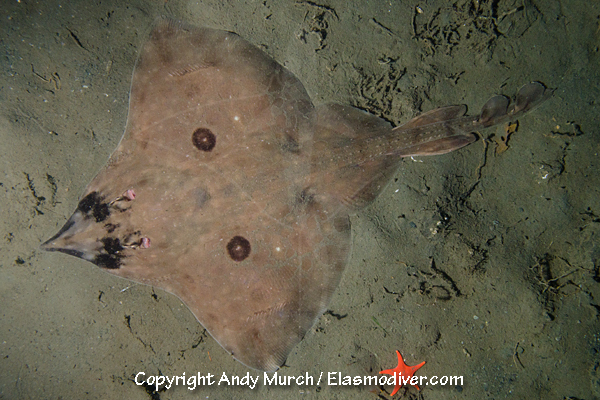 Anyone finding a Longnose skate whilst diving is encouraged to contact me in order to built an information base of sightings. Useful information would include depth, time of year, and bottom composition. Coastal Fish Identification, California to Alaska. - Paul Humann - New World Publications. Pacific Fishes of Canada - J.L.Hart. Fisheries Research board of Canada. Ottawa 1973.